What is the average monthly data use for iOS and Android users on the major U.S. carriers? NPD's Connected Intelligence monitors 1,200 handsets using the firm's SmartMeter software, which phone owners install in return for an "incentive". Fierce Wireless keeps track of 200 Apple iPhone units, up from 100 in September. Merging the figures from both tracking operations, we can come up with an average amount of data (in GB) that Android and iOS customers use on each of the four major U.S. mobile operators. The data show that the average Android packin' Verizon customer has sharply curtailed the use of data on his/her phone since April, the earliest that the data is available. During the 7 months that data use has been tracked by NPD, the average amount of data used by Verizon's Android customers has dropped nearly in half from .97GB a month to .50GB. Some of this decline could be due to the end of unlimited data for new customers and for those upgrading to a 4G phone at Verizon. Not surprisingly, thanks to its unlimited data plan, T-Mobile's customers consume the most data on average among Android users on the top four carriers, 1.23GB. The all-you-can-eat data plan launched early in September and since then the average amount of data consumed on an Android device has risen from August's 1.02GB to October's 1.23GB. 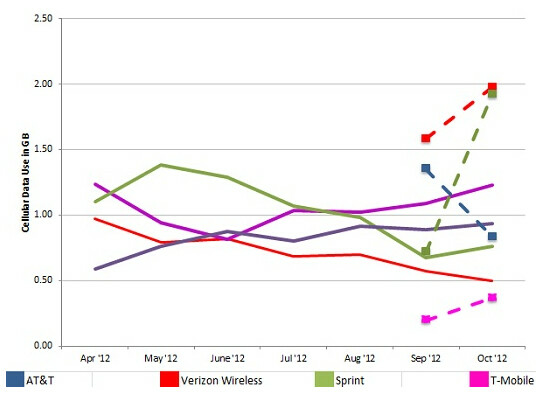 What might be a surprise is the unexplained drop in data usage for Sprint's Android owners. 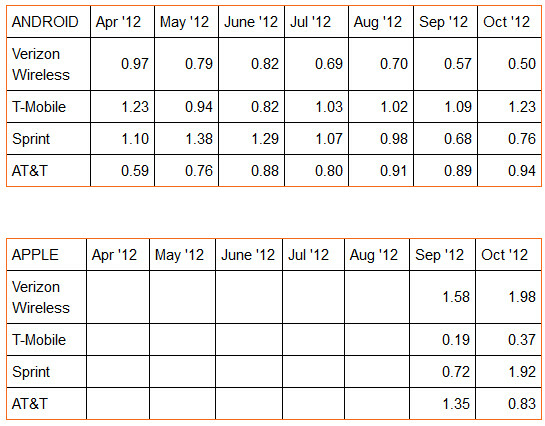 Despite Sprint's unlimited data plans, the numbers have declined from 1.38GB in May to October's .76GB. In the two months of data available for Apple iPhone users, three of the four carriers have seen more data consumed by the average iPhone user in October than the month before. That includes those using an unlocked version of the device over T-Mobile. While the carrier doesn't currently offer the Apple iPhone, it is expected to offer the smartphone next year. Only AT&T's customers sporting Apple's iconic handset used less data in October than in September. With an average data usage of 1.98GB for October, Verizon customers consumed the most data over their iPhone, followed by Sprint customers with an average 1.92GB of data used. Some of the decline may be due to users wising up to the fact that wifi will often serve them better than their OTA data connection. Or they're all planning ahead for more limited data plans. I would actually say it probably has to do with battery life. I can almost get a whole day if I'm on Wifi, but less than that if I use 3/4G(LTE). I'm on Big Crappy Red, and that is the major contributing factor to my decline in usage. My usage as gone from 4-7 gb a month to 1-2 gb a month. Same thing for me. I'm on Sprint with Android and I'm spending a lot of time in ancient brick, signal killing, buildings on campus and using WiFi will nearly double my battery life, not to mention being literally 50 times faster than optimal EVDO A performance. I went from 3-5GBs to less than 2 consistently. Also I think it's pretty fair evidence that unlimited can be sustainable as long as you don't act like the shortsighted jerks in the threads below me. Seriously guys. Using data like a child is the reason for data caps, throttling, and rising prices. That and people who buy iPhones from carriers. I am an Android user on Verizon. I average 25 to 30 Gigabytes monthly. For the month of November I used 101 Gigabytes! I do have UNLIMITED data and I pay $19.99 a month. And no Verizon has NEVER throttled my usage. Funny, I average the same and used a 100 GB Nov as well...I still think that was some type of error. Although I stream a lot,I can't figure the logic in my using 100GB!! Okay, you and the guy below/above (bparkerson) have me beat, I only used 45GB at the end of my last billing cycle in mid November. All that should change, though, with Multi Windows, 4G and LTE on my Galaxy Note II ♡ And, you are correct, Verizon does not throttle!! Dear Chinese Muscle Boy, +1 for you and A+ for effort. Though, I doubt someone would trade this beast for that beast (don't worry, you'll have Multi Windows soon on the SIII). Look on the bright side, at least you're not on Sprint like Commentator below; it would tragic (TRAGIC I TELL YOU!!) 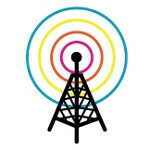 to have an SIII on 3G like in most Sprint markets. TRAGIC!! And why would that be? please do try to explain why that would be why we never get unlimited back. cause i think that will be the reason we will. As most smartphone owners don't use their phones for a tenth of what they can do (teathering, streaming, downloads, ext.) they check their email and facebook/twitter. I use on avg. 30-60gb a month on verizons 4g network and there is no reason why that should cost any more than 2-4gb plans thay have now. maybe a dollar or two more power useage by the tower but other than that its just greed. So if 2GB or less is now the norm on Verizon then do most iPhone users go over their data plans? Most iPhone owners only use iWiFi since, that's how they have been iConditioned; exceeding their allowance is not really an issue for them. Their biggest Data guzzling app' is Apple Maps (and, that's only cuz' they have to keep refreshing until Apple Maps gets it right♥). Well, either that or they're like me on Sprint. I only average around 7GB/month, but 95% is on WiFi because of Spring's crap network, and due to the fact I'm within range of a strong WiFi signal 95% of the time. Watching iPhone users have to use WiFi to download certain things and use certain apps does make me laugh though. I could never get used to that! But then all the tastiness sinks to the bottom. The reason the data usage numbers are going down for VZW is certainly due to the new tiered pricing model based solely on data usage. Making people more conscious of how much data they are using and deterring many from using their phones and apps the way they were designed to be used. As for me I've been on an unlimited LTE plan on VZW for over a year and half and once they ended my ability to get discount pricing on handsets and keeping my plan, my thoughts on my data usage changed as well. I went from monitoring my usage in attempt to not be a data hog ~2-3GB/mo. to using no less than 7GB/mo. for the past few months. If VZW wants to be that stingy with their data pipe I'll just look at them as dumb data pipe and make sure I get my monies worth in data usage. I'm sure I'll be using much more data as more streaming apps become available. I am on sprint and use 10-13gb a month easily.... don't ask me how! Haha. I would expect those who own androids to have home wifi networks, therefor lowering their data usage. I'm not saying that those with iPhones don't have WiFi networks, its just they done know to use them. Most people I know with iPhones don't know the difference between 3G/4G and wifi where those with androids generally do. This may be slightly prejudice of me to say but its just my opinion. Actually you might have a point. I'm not saying that the iphone users are stupid, but I also have many friends, not young, 45-50 years old that use iphones and they have never accessed the app store for example. One of my best friends for example keeps saying that my S3 is so much better than his 4S but I always tell him that indeed it is better but not for the reasons he thinks it is or not for what he needs. And of course he had no idea what that wifi is..meaning he used only network data. And believe me..he is not stupid, just..he was never interested in these things, he was a Nokia Communicator fan, and due to the fact that everyone was so excited about iphones and they were so advertised he chose it when he changed the phone. im currently on Sprint with an s3 and new evo lte. i use about 10-20 GB of data over the cellular network . the only reason i can fathom that Sprints cellular data dropped is because last year 75% of the androids (s2, evo 3d, evo, conquer, Epic, and Photon were WiMax equipped, which while isnt as fast as LTE its much faster than 3G CDMA. and since the current crop ( iphone 5, note 2, s3, evo4glte, victory, photon q, viper, and optimus g) are lte. and since the lte footprint is so small what we sprint users are running for wifi hot spots. Where Wimax was available for Sprint customers, people used it and certainly accounted for some decent data usage. Fast forward to today, where most customers have upgraded to a newer LTE device without the LTE coverage, they're back to using 3G. It's understandable, but I had no idea data usage was so high with iPhone users. Crazy...LSUtigers, does Airvana count towards 3G usage? I think the data shows a fairly simply (and obvious) conclusion. iPhone users do more with their devices. The Android data might be diluted by those users switching from cheap feature phones to cheap Android smartphones who don't actually need or use a smartphone. I tend to use wifi when possible nowadays, its faster, more reliable, and isnt as big of a drain on battery. I probably average 500mb-700mb a month, I used to pull about 1.5 gb before I started using Wifi more.